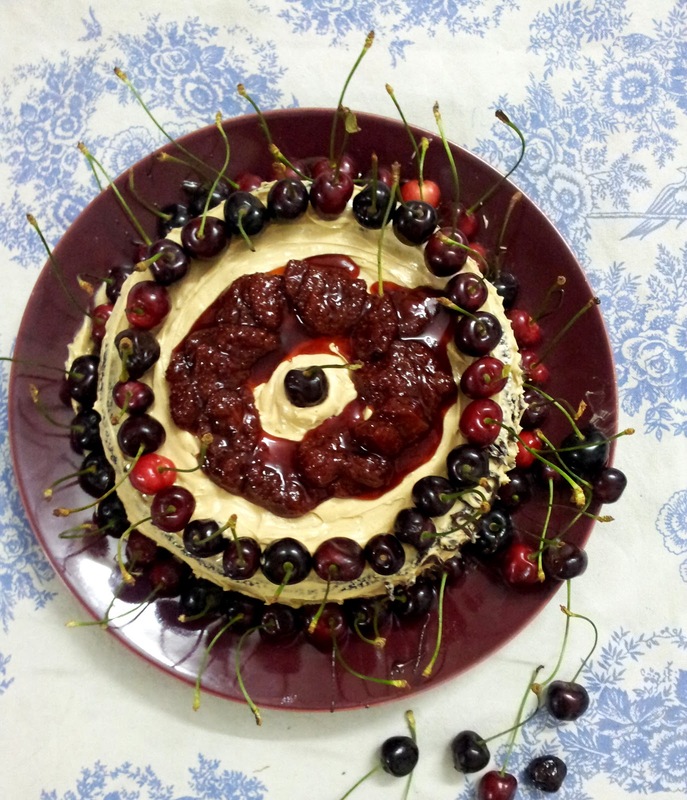 Flour less cakes are so easy to put together most new home bakers don't realise. Flour just provides body to the cake and the actual flavors are brought in by other ingredients. Yes the airy and porous character comes from white flour but if you have been away from white flour for as long as me you would love the nuttiness of the whole wheat flour and the rustic character provided by Ragi in the cakes. 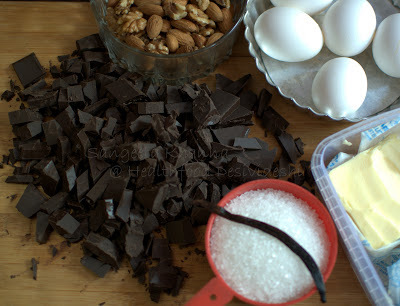 Nut meals are great substitute for cakes especially if you are baking a dark chocolate cake. I have been baking loaf style flour less cakes for the husband but I realised I haven't posted the recipe yet when some friends asked me for the recipe. I had baked this cake and iced it minimally with coffee flavored butter cream for a very dear friend of mine Varsha Tiwary who writes Wholsome Options. Talking about flour less cakes, they are easier when you aim for rich chocolate in the cake more than fluffiness. I make a lemon cake with almond meal as well and that turns out fairly fluffy. That recipe will be shared later sometime. I just wanted to communicate that flour less cakes are no scary monsters to handle. Actually I was taken aback when a lady Chef of a five star establishment recently was asking a group of us bloggers and home bakers whether we bake flour less cakes. As if it was some rocket science and we didn't have an idea of rocket fuel. I was miffed at this question and was amused secretly when the flour less cake arrived at dessert time. The cake was so offensively eggy that no one had it after a couple of spoonfuls. But that is another story. Look at this cake, the picture taken by my cellphone camera as I forgot to carry my camera to Varsha's place. Two excited kids around a casually dressed up cake makes you believe in real food being much much better than the artificial colour of cartoon faced or theme cakes. Powder the sugar along with chopped or scissor cut vanilla bean. Powder the nuts together in the same mixer. Keep aside. Chop the dark chocolate in small bits, I had kept the dark chocolate slab at room temperature for a day and it cut like pumpkin, Delhi summers I tell you. Line the baking tins with parchment paper, keeping a margin above the tin rim so you can pull out the cake easily. No need to grease it. Melt the chocolate and butter together in double boiler. Whisk together along with cocoa powder till smooth and shiny. Break the eggs in a separate bowl, whisk lightly. Add the lightly whisked eggs one by one, add the powdered vanilla and sugar and whisk them all together. It will be a dark dark gooey mix. Add the nut powder to the batter now. I normally sieve it into the bowl so any small bits are prevented form going into the batter. I personally don't like nut bits in a nut flour cake. Whisk together again, but not too much. 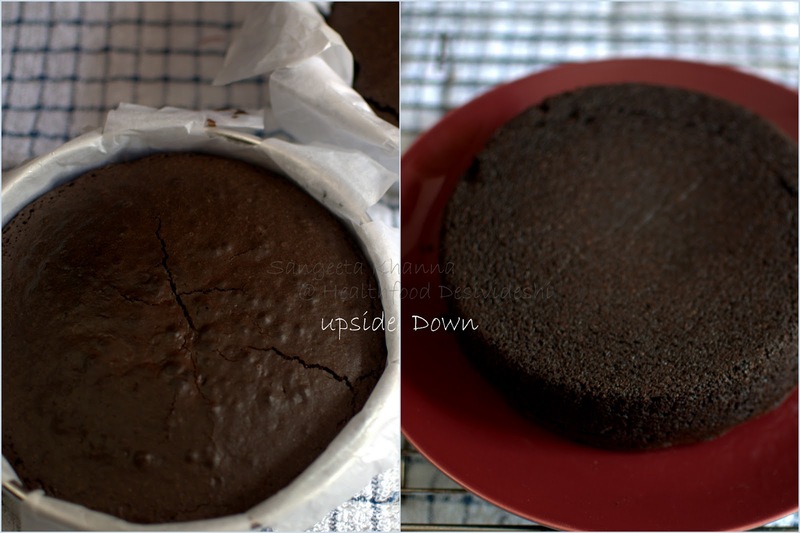 Pour into the lined baking tin, I baked a 7 inch diameter round cake and a small 5 inch thinner cake for the husband. You can use any convenient size of tin or bake several small cakes or cupcakes. Bake at 170 degree C for 40 minutes on the middle rack, keep checking the cake after 30 minutes if your tin is large and height of the cake is lesser. 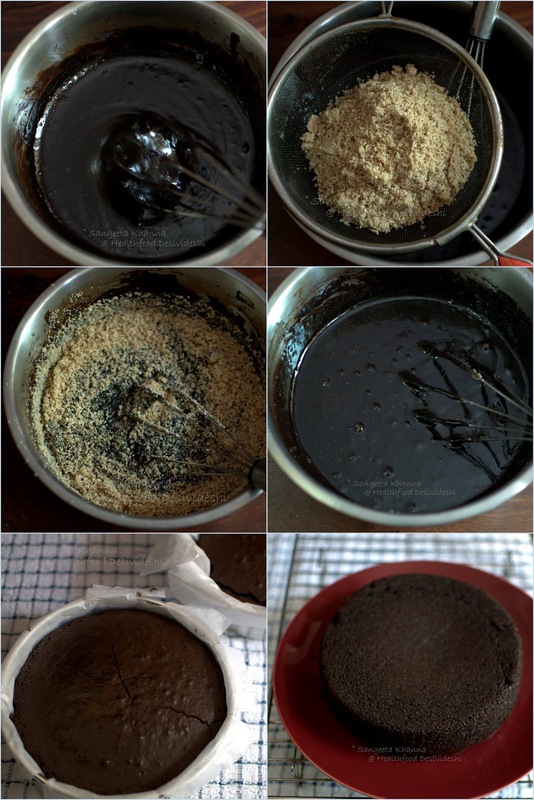 The margins should look dried up and the center of the cake should rise and get firm. The skewer test doesn't work with this cake as the large amount of dark chocolate keeps it gooey even when the cake is cooked. You will see a few cracks on the surface too. Take the cake out and let it cool. The center will come to level and you can try loosening the edges by lifting the parchment edge. Invert the cake in a plate when cool and peel off the parchment very carefully. Let it cool completely before applying the butter cream icing. Ingredients for butter cream icing..
Whisk the butter with a wire whisk until completely creamed and fluffy. Add powdered sugar and whip again to imbibe. Add the coffee and incorporate again by more whipping. Cover the cake from all sides using this butter cream. 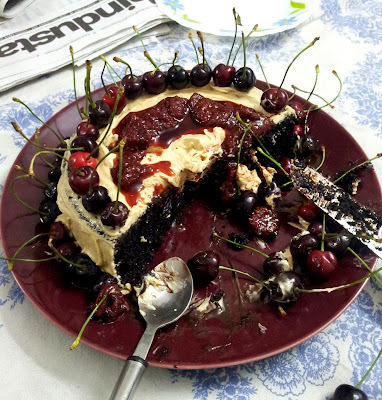 To decorate I used dark cherries. I knew kids would love it and it will still be an adult cake. 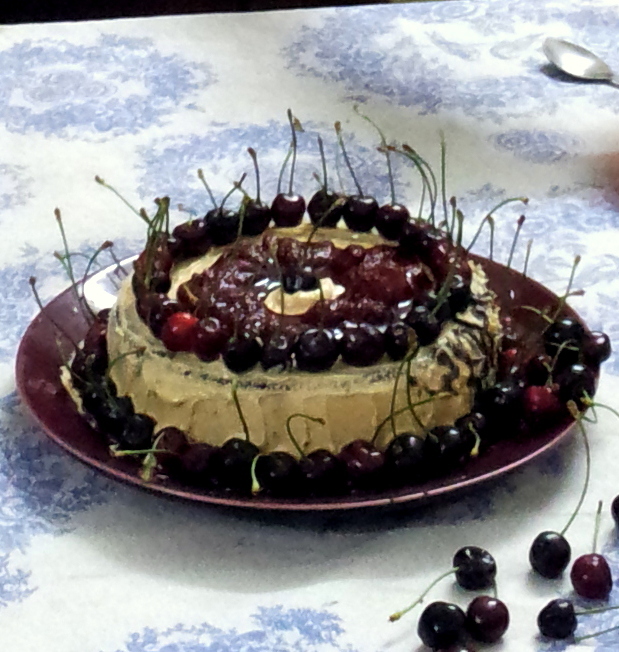 I melted 1/3 cup of dark chocolate in cup and coated the cherries in it before arranging them on the base margin. 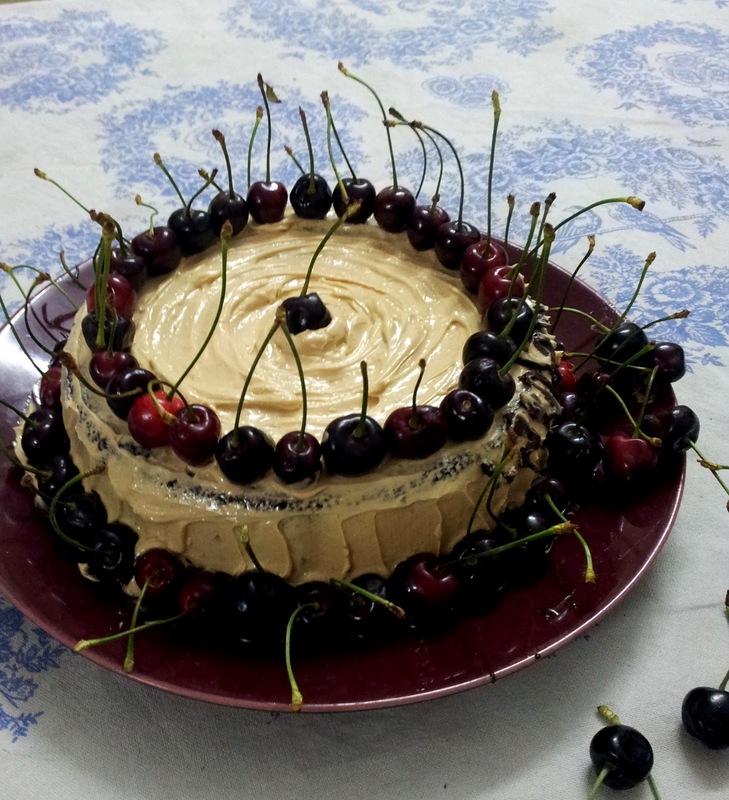 On the cake margin the cherries sit by themselves owing to the butter cream consistency. 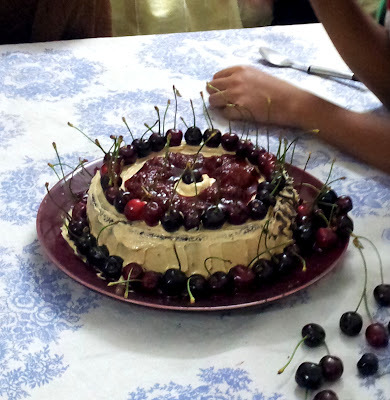 Though the butter cream started turning soft and melting owing to the higher room temperature...Delhi summers again. So I just poured the poached balsamic strawberries around the center cherry. The kids swooned and I felt immense pleasure at seeing kids in today's environment swooning for something so simple, real and wholesome. Wholesome options for everyone I say. I had also made a dark chocolate collar for the cake, but transportation and then the decoration in front of curious kids left the collar melting sticky. It couldn't transfer on the butter cream icing. You would see a small part or the cake's margin with smudged collar. No one cared. The balsamic poached strawberries were a perfect foil to round off the dark chocolate flavors with mild sweetness. The icing was also very mild sweet, hint of coffee to just like a faint whiff. The flavors rounded off well. And this whole exercise was pure bliss, immense therapy for me. Trust me. 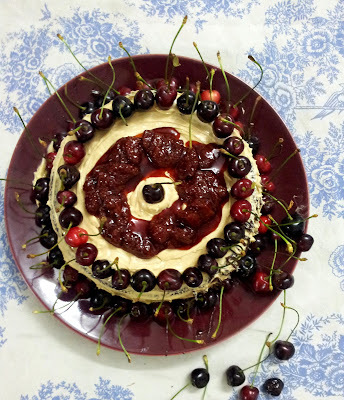 An absolutely beautiful flourless cake! The dark chocolate with cherries and strawberries are beautiful flavors paired with dark chocolate. 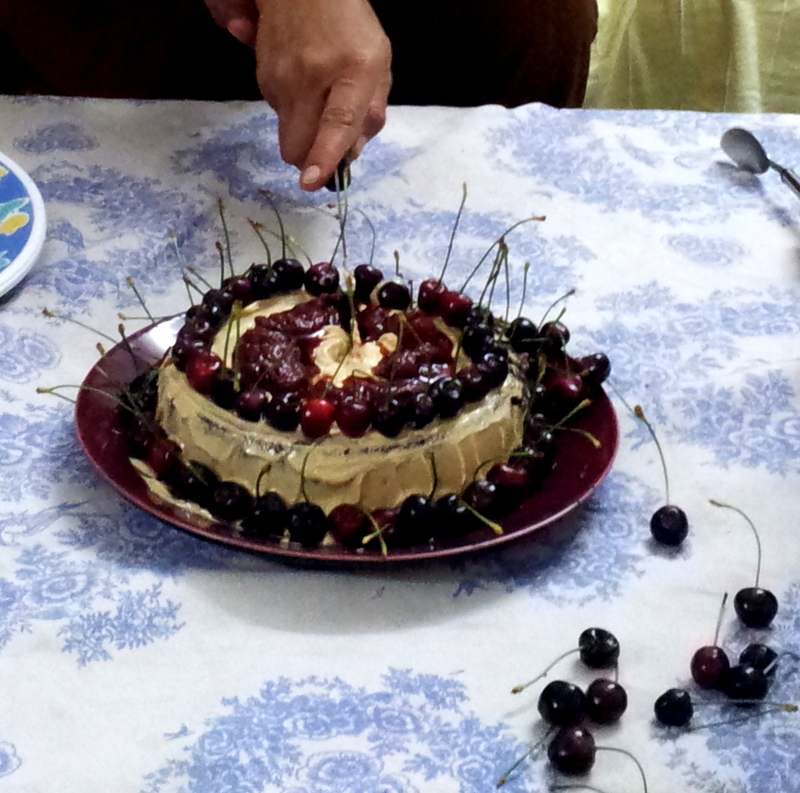 Yes Deeba, food, baking and an opportunity to feed the loved ones..it's all so therapeutic. waah bhai waah ek baar dil phir se khuah ho gaya !the kind of thought and effort put in makes me feel so special ! the time effort and love you put in makes me feel soo special ! Yes Yummy mummy, the cake can be done in microwave too. On convection setting it will take about 25 minutes I guess and on micro setting no more than 6 minutes or keep a watch on the center of the cake and stop when it sets after puffing up a little. Can the balsamic poached strawberry be done without any sugar? So glad you liked it Agnija. Thank you. Yes the balsamic poached strawberries can be done without sugar if you like, just pick the sweetest of strawberries and go ahead. 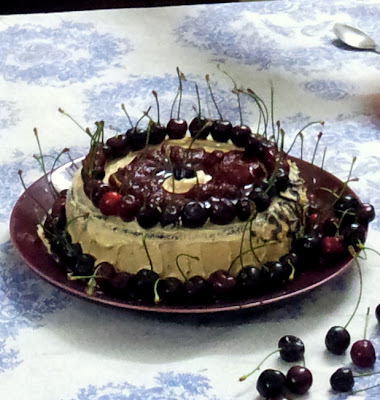 loved making this cake for christmas, it was gooey and i loved it better than flour cakes, though husband wasnt a convert!! So glad that you liked this cake Sush. So sorry for the mistake, I hope you figured and baked the cake alright. Editing the recipe pronto thanks once again.